I’m so thankful to the J.LIVE Speech Contest for allowing me to attend Nanzan University for eight weeks this summer. 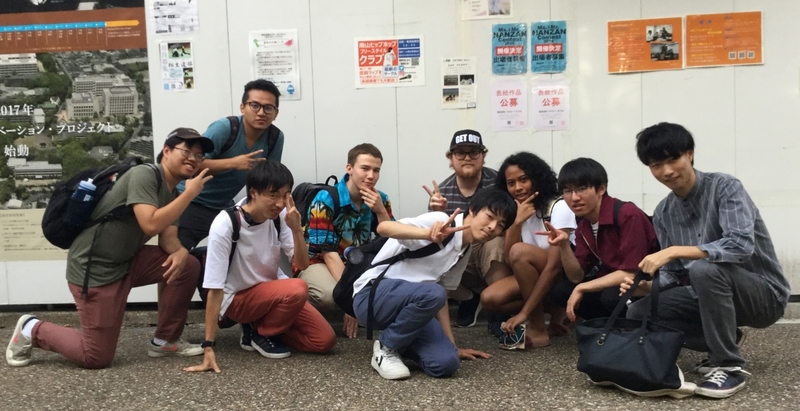 This year, around seventy students participated in the university’s Summer Japanese Program for foreign students, split into six different levels by a placement test. Students largely came from the United States. Although a handful of Chinese students came directly from China, most students who weren’t born in the United States still belonged to U.S. universities. I tested into the highest level and was in a class with seven other students. All students took a general language course from about nine to noon every day. In addition, we also could take electives such as Japanese dance, tea ceremony, wood block printing, and business Japanese, among others. I took business Japanese. After/in between classes students could go to either the Japan Plaza or a room called Stela, where they could sign in and talk with Japanese friends and also receive homework help from Japanese T.A’s who worked there. Outside of class, field trips organized by the Program included pottery-making, a science museum, a Japanese candy-making workshop, the Grand Sumo Tournament (held only six times a year, with only one of those times being in Nagoya!) and a place called Meiji Mura. At the end of our eight weeks, we also had a Summer Japanese Program graduation ceremony. I was picked by our teachers to represent all exchange students and give a thank-you speech at the ceremony. 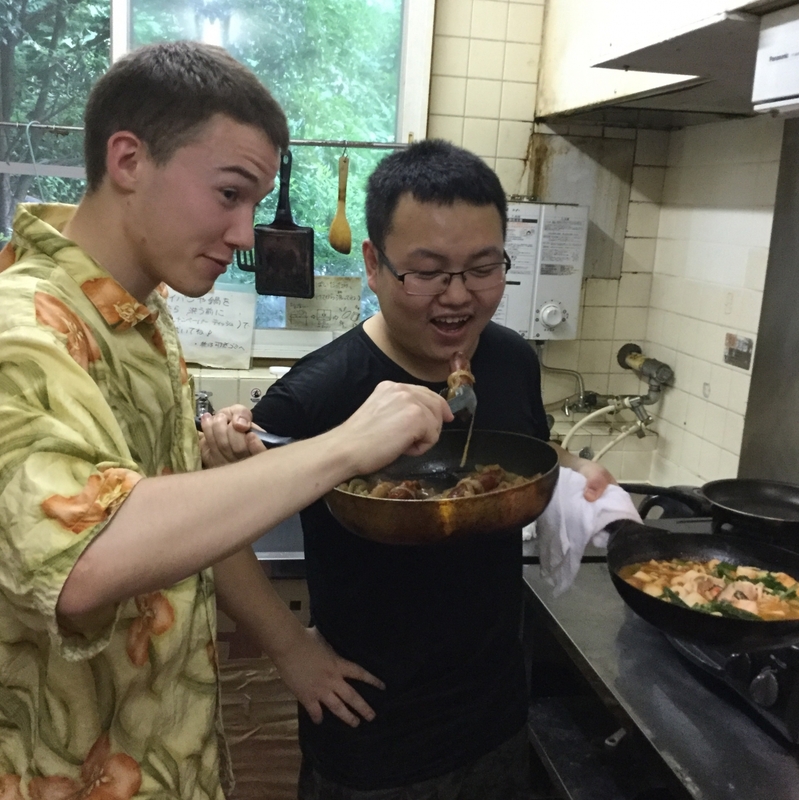 Students of Nanzan’s Summer Japanese Program are given the option of a home stay or a dorm. The girls’ dorm, NKK, is across the street from Nanzan, and the boys’ dorm is down the hill from the girls dorm. Yes, the hill is big, and yes, the weather reaches 100 degrees! However, I was surprised to learn during my time in Nagoya how Japanese students typically live with their parents throughout their four years of undergrad. With many of our Japanese friends commuting an hour or more sometimes for school, living in the dorm was quite a reprieve. In the boys’ dorm there were sixteen international students and four Japanese students. I personally loved living in the dorms so much. There was a big kitchen with utensils, pots, and pans that everyone could use, so simply cooking and eating downstairs would help you make friends. One night I hit up one of my best friends and dorm mates from China, as well as a Japanese friend from Akita and an American friend from Nebraska and organized an international foods night. We invited our friends and ate beer brats (my best attempt to represent Wisconsin since I couldn’t feasibly make cheese curds), mala tang, the Akita rice stick kiritanpo, and Nebraska chili (though local custom usually calls for cinnamon buns on the side, she told me.) 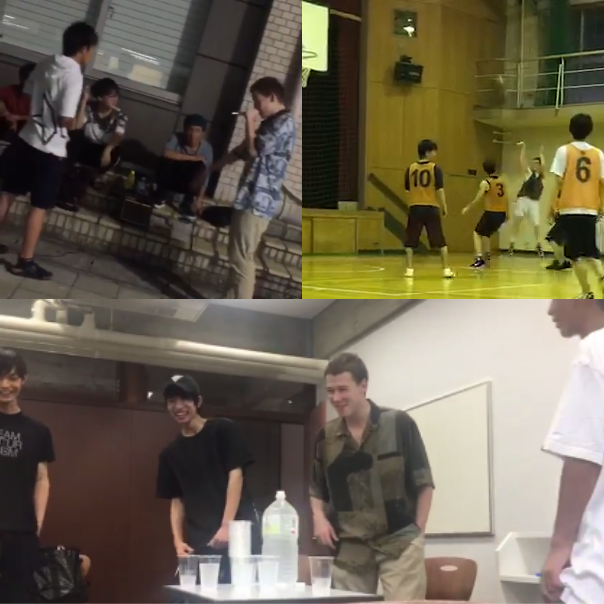 The YKK boys’ dorm also hosted some super fun events, such as NKK+YKK welcome night and the Summer International Party. Something I found different than the United States and China was that in Nagoya there were almost no outdoor basketball hoops. Campus didn’t have any outdoor hoops, and the campus gym was almost always being used by gym classes and school clubs. However, a Japanese friend of mine told me about inkare (from the English IN-ter COLLEge), which is where students from different universities meet up and play sports at high school and middle school gyms at planned times. I later brought my Chinese and Japanese friends to play basketball at different inkare that I found on Twitter. It was not only fun to play basketball in Japan and meet people from other universities, but it was also a unique Japanese experience different than any way I had played basketball before. 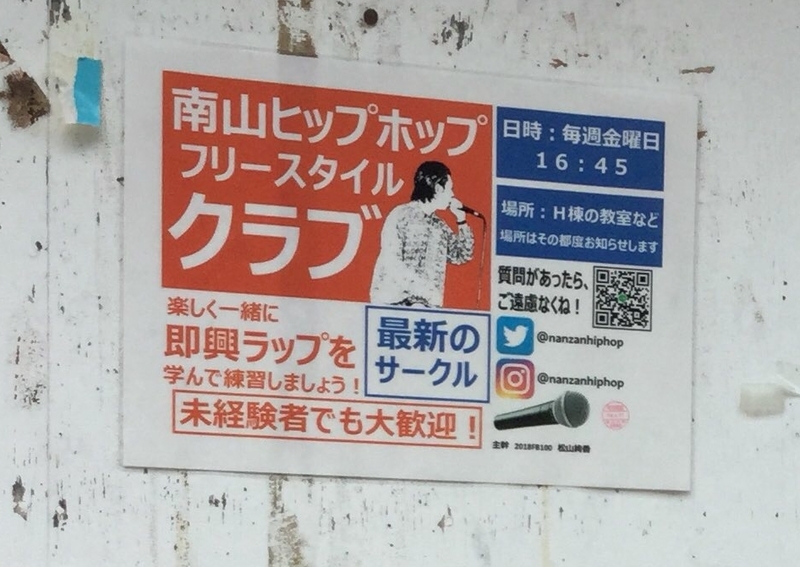 people who followed me, one person retweeted a picture of my poster and wrote “It looks like Nanzan finally has its own freestyle club!” After his picture was posted, I got followed by a handful of other freestyle rap groups around Aichi prefecture, including groups that met outside nearby Nagoya University and the Akaike subway station. I saw that the Nagoya University group was going to meet the very next day, so I went myself. We met in the parking lot of the Toyota Auditorium and freestyled for a while, with topics spanning the shoes we were wearing to eating curry. There were about ten of us. After freestyling in a circle for a while, we freestyle battled each other for the second half of the meeting. Battle rapping is a much bigger part of hip-hop in Japan than it is in the United States, and it’s also much different. Compared to battle rapping any other part of the world, Japanese battling is the fastest paced, with emphasis on instant rebuttals on your opponent’s verse. I would later go to the Nagoya University meeting again, and I went to the Akaike train station meet-up twice as well. As for my own club I had founded back at Nanzan, I was able to host it four times. It was visited by Nanzan students, students from other universities, technical school students, and high school students, a handful of whom I met at Nagoya University and Akaike. I can’t thank J.LIVE enough for everything this summer. These past eight weeks have helped me so much, and being able to take intensive Japanese classes and make Japanese friends at Nanzan was just the start. Starting Hip-Hop Freestyle Club gave me a great way to practice networking and organizing people, and I also learned a great deal about cooking from my friends in the dorm as well! I finished off my eight weeks with a 4-16 W/L record in battling, which I’m content with for it being in Japanese. As I look forward to spending this next semester as an exchange student at National Taiwan University, I’m looking forward to continue interacting with the large number of Japanese students and students of Japanese at my school. My time at Nanzan helped me grow so much in eight weeks, and I can’t imagine how I would be without all these experiences. I want to thank J.LIVE, George Washington University, the sponsors, and all the organizers who made this possible for me. I want to wish this year’s contestants good luck! Before I write anything else, I would like to thank the J.LIVE Talk for giving me this incredible opportunity to study at the Naganuma Language School. I really enjoyed my entire experience there, and I am so grateful to those on the J.LIVE Committee and the sponsors for making it all possible. Overall, my time at Naganuma Language School was productive and fun. The school was incredibly welcoming, and the classes and teachers were top-notch. Although my time was short, I will remember both the Japanese I learned and the memories and friendships that I made in Tokyo. In this report, after a brief overview of my time, I will discuss the classes at Naganuma and other support and resources at the school. I also will describe my life in Tokyo, how I did or did not meet my goals for my time there, and some things that I wish I had done differently. Photographs are attached at the end. I was in Tokyo from June 8 through July 23 (about six weeks). Due to scheduling conflicts on my end, I was at Naganuma for the last two weeks of the spring semester, then a one-week break, and then the first three weeks of the summer semester. This meant my classmates changed part-way through, but it was still a good experience. I lived in Shibuya (right by Shibuya station) at a guest house (essentially a dorm). First of all, the classes were well-taught, and I could not have wished for better. Naganuma school is divided into three different “departments” or 学科, each with their own classes and curricula: business (for those seeking work), academic (入学, or those seeking to enter a university in Japan), and general. I was in the general department, which meant that classes were geared toward general improvement in Japanese. Classes were from 9-12:30 Monday-Friday. Each day was broken up into four class periods of 45 minutes with breaks in between, but for the whole day I was with the same group of students in the same room. We had about three teachers who rotated, with one being our main teacher. I was placed in the highest class (E1) for the spring semester, and stayed there for the summer semester (while my classmates moved up to E2). The first two periods we studied a Japanese text (usually an interesting essay or short story in Japanese) and dove into grammar points and vocabulary as we read along. The second two periods were a grab-bag of assorted things—news broadcasts, newspapers, writing emails, group discussion, NHK dramas, listening, extended grammar discussion, and more. I thought the varied format kept the class from becoming monotonous, while at the same time helping us learn a variety of skills. The other students I studied with had a variety of backgrounds, but were all there to study. It made for an international and motivating time. For the first semester, my classmates came from Taiwan, China, South Korea, Vietnam, Thailand, and Mexico/Finland/Asia (I never did figure out the last one). As the resident Westerner, my input was often solicited when questions arose. For the second semester, my classmates were from the UK, the US, Taiwan, Philippines, and South Korea. While I enjoyed both my classes, I think the first semester forced me to practice my Japanese more, since it was the lingua franca of the classroom. As I mentioned above, class periods were shared between three teachers, with one being the main teacher (who was always there for at least two periods every day). Luckily, I had the same main teacher for both semesters. I was amazed by how enthusiastic, encouraging, knowledgeable, and overall well-trained they were. If I were giving professor reviews, all of them would rate as five stars. Apart from classes, there were field trips, school culture learning events, and special lecture days that put an emphasis on culture. We visited the Edo-Tokyo Open Air Architectural Museum (江戸東京たてもの園) on my last class day, and every semester the class does a similar excursion to a learning site or museum around Tokyo. We had one culture event, where our class and another class learned calligraphy (書道). I was unable to participate in the special lecture days, but for these you would sign up for a topic in advance, and then on that day the whole school would stop their regular classes and people would go to special classes on topics like Japanese history, Japanese honorifics, the tea ceremony, or other interesting things. All these events helped to add in Japanese culture, which is an important part of language learning (not to mention that it is fun). The school also holds a speech contest each semester, but unfortunately I left before I could participate. I think speech contests are a great way to not only polish public speaking skills, but also things like pronunciation and intonation. It can also be a great way to dive deep into a topic that is meaningful for you. The teachers and staff were also helpful outside of class time in answering questions and explaining tough spots. Ms. Koyama, the main coordinator for my time there, helped me after class a few times going over grammar points not covered in class, or recruiting another teacher to assist me. I also went over things like email etiquette with one of the teachers as well. On the whole, if you really wanted to learn more about something, the teachers went above and beyond to help. I could not have been more grateful. Naganuma also had a small library room on campus, as well as a computer lounge. Both were helpful, as I could check out Japanese language resources or novels, and also study after classes. As I mentioned above, I lived at a "guest house" called Urban Place Shibuya East, run by the real estate company Fujimi House. I had a pretty small room—lofted bed, wardrobe, desk/chair, and chest of drawers, plus a tiny window. I found that with no room to put a mess I had to keep things tidy. There was a shared kitchen and bathroom, and private showers. Unfortunately, cleaning was "the responsibility of tenants" which meant that nothing got cleaned much. With 12 people with different schedules there was no accountability structure. But it was still pretty decent, and the company did do a general clean every two weeks. The building was eight stories, and my floor had 16 rooms (mixed gender). It was a rotating mix of people there but I can honestly say I made good friends and enjoyed living there. The other people did genuinely interesting stuff—architecture, robotics, engineering, game design, culinary school (these were interns on a JICA program), music producing, jiujitsu, finance—and many were at prestigious places. I was so glad I made the time and effort to get to know the other people in my dorm, even though it was so easy to just stay cooped up in my room. I think it made me grow as a person. Luckily, I was able to settle into a routine of walking to school in the morning, class, lunch by myself or with friends, studying in the afternoon, and coming home around dinner. I was a bit at a loss at first of what to do after class—it was a lot of free time—but I think by the end I was able to use it more productively. When I was not at the dorm or studying at school, I was exploring Tokyo or meeting up with friends (either from before or ones that I made there). I won’t go into detail about every place I visited, but it included Tokyo Tower, the East Imperial Gardens, Yokohama (twice), fine sushi, Tsukiji, and of course downtown Shibuya. Tokyo is a great city to try new things and explore, and I would always love to go back. My initial goal was to improve Japanese (as a way of preparing for my CIR job in the JET Program), be more outgoing, and have fun (along with a couple other personal goals). I thought I did a pretty good job with these goals, by putting effort into learning Japanese, making some good friends both at Naganuma and at my dorm, and creating some great memories. I think the balance between study and fun helped enhance both, and I have few regrets about my time there. However, I do wish I could have done a few things differently. I did not articulate what “improving Japanese” meant until relatively late after I arrived. I wish I had thought more about the skills I wanted to prepare for my job, and made those my focus. Even more importantly, I wish I had articulated these Japanese goals to the staff at Naganuma as well. I am sure they would have been more than happy to arrange things differently if I had been clear about what I wanted. If I could give one piece of advice to future winners, it would be to think through your goals, while making sure to enjoy your time. I also wish I had prepared myself to practice my Japanese more outside of class. Although with some of my Naganuma friends we spoke Japanese, I was still around other foreigners most of the time which meant a lot of English and only some Japanese. I still do not regret the friends and relationships I built, as I consider them valuable even if we spoke in English. That being said, I wonder if I could have set myself up with something like a volunteer activity, or spoken with the Naganuma staff about what the best approach would be. I would encourage future winners to prepare themselves as well. In conclusion, my time at Naganuma was valuable for the Japanese I learned, the experiences I took part in, and the friendships I made. I was amazed by the quality of Naganuma Language School, and I hope that later winners are able to use the resources to their full advantage. Thank you again to J.LIVE for making this possible for me.